Yves here. 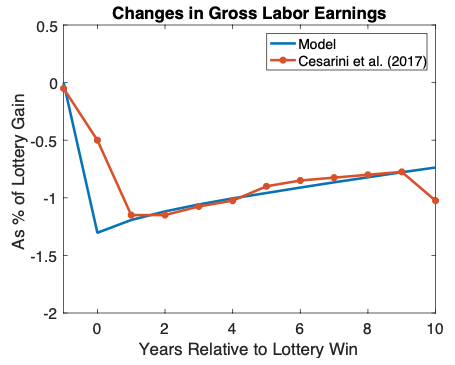 This post reaches a conclusion that might seem obvious: rich heirs tend not to work much. However. all sorts of wealthy people would like you to believe otherwise. The “not working much” matters because they produce less in labor income which would add to output and be taxed. Of course, if you are a currency issuer, you don’t need to tax to spend, but state and local governments, and Eurozone countries that are currency users do need to worry about tax revenues to fund spending. 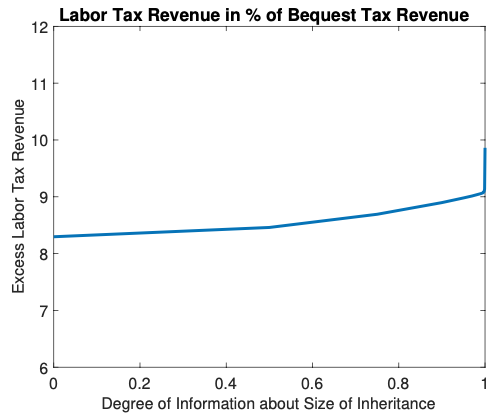 Although inheritance taxes are of growing importance for Western economies in raising government revenue, little is known about how inheritance taxation affects individuals’ incentives to work. This column explores how much additional labour income tax revenue from heirs the government can expect to obtainfor each euro of revenue raised directly through inheritance taxes. It concludes that additional labour tax payments from heirs, resulting from an increase in bequest taxes, are of sizable magnitude and should be taken into account in fiscal planning and welfare analysis. The rich and powerful have promulgated the myth that all efforts to make wealth distribution more fair are ‘Social Engineering’, and as such are the evil result of the wrong-minded ‘liberal’ delusion that taking money from ‘successful, hard-working job-creators’ and giving it to lazy takers results in a more fair society. Comparing our situation at the present, with the situation in the late 1950s, when the top tax bracket was 91% is proof positive that that story is indeed a myth. The rich and powerful, in the person of DT have been busy pushing a populist wave by way of nostalgia for exactly that time period when the tax system was earnestly employed to curb their ability to buy our government, and selfishly wreck our social order. One could make the argument that the American revolution was ‘Social Engineering’ writ large, the Progressive Era, and the New Deal certainly were. It is so sad to see generations of people who were the beneficiaries of ‘Social Engineering’, convinced that it is now an evil, and existential threat. It seems easy to flip that and cast the situation with the working class as the “hard-working job-creators” and the rich as “lazy takers”. I’ve appreciated comments in the past wondering about the lack of concern for the moral hazard inheritors have from unearned windfalls. Will no one think of the inheriting children? Like a lot of things that seem easy, but we’re having a pretty hard time getting any traction for an idea that seems obvious, aren’t we? I guess that it is all a function of what is important to the individual. If one were starving, what matter if the world were round or flat? Similarly, if one is intellectually blinkered…..in school, by television, radio, and now the internet. Sorry Yves but this article is appalling. Implicit here is the premise that we exist only as worker bees to be taxed: that’s all there is to us! When even a countercultural site like NC embraces such ideology is it any wonder that we landed (collectively) where we did? There is a case to be made for inheritance tax but these laborious computations of how much more the state could have taxed someone over the course of his lifetime had he not inherited (or inherited less) are just ghoulish. I’d rather that Paris Hilton wallow in her unearned riches than that we be governed by people with such a mindset. I always them I like to explore, go hiking & observe, and then there’s this pregnant pause followed by “No, what do you do for a living?”. We are governed by Paris Hilton’s bankers and money managers. While she is not personally the problem, she is representative of an array of systemic problems. We don’t really need her money or even her head in a basket, however well deserved such a fate might be. Agreed on allowing Paris Hilton to wallow in the unearned riches. Because she’d probably be a nonstop headache in any workplace. To you, Wuk, and John Beech below, I respectfully call bullsh*t. A lot of LUCK goes into this along with whatever is EARNED. Be real with yourselves, please. Since I relocated two years ago to take care of my mom I haven’t had a job. Although I have some income from renting out my Chicago condo, there is no way I could do this without dipping into my inheritance from my Dad (no comparison to the Hilton millions there; he was an econ prof at a midwestern public university). And while it could be said that it is a good thing to be caring for my mom, wouldn’t it equally be a good thing if the many people I know back in the ‘hood on the south side could take time off from their grueling minimum wage jobs to care for their parents? The difference is luck, not virtue. Anyone who is the least bit spiritual ought to be able to humble themselves enough to know that. I hope you are receiving a bit of care yourself. You are doing hard work. Luck for me was showing up when opportunity made itself apparent, but my best attribute in the remembering game before computers was my ability to beat other brains to a pulp in business-they hardly had a chance against me, oh, and being very near-sided was quite a gift in my field of endeavor, also. I can’t speak for those less fortunate, but I made the best of what abilities I had in my quiver. Virtue is what politicians claim to have, but seldom do. I’m sure my parents read to me, although memories before I was say 4 are really vague. I started reading when I was 5. Do not pigeonhole this site. We don’t take positions to cater to your ideological preferences. Work is part of the human condition unless you think having personal slaves is a good social order. I don’t and I abhor people who denigrate work because they denigrate everyone who does work, like hospital orderlies, janitors, truck drivers, checkout clerks, fry cooks, and school teachers. One of the considerations of retiring from nearly 30 years of working in the midst of the first year of the 2nd term of Bush the younger, was the idea that I was financing wars I didn’t believe in by paying taxes, and it became unconscionable, so I cut them off. I also allowed others to fill in the void I created by leaving the workplace. Not everybody has the same advantages I had, and many have to work until they can barely do it anymore, or death comes calling. To me, they sometimes resemble slaves unable to break the economic shackles bounding them. By “work” I also mean unpaid work, although the US economy has changed so that a lot of formerly unpaid work is now paid. You can hire someone to pick up your order at Whole Foods and deliver it to you or stand in line for you, gah. People still have to work even if they are not formally employed. They need to eat. Someone grew that food and delivered it to where they could buy it. It’s cooked either by you or someone else. I presume you do not live in total squalor, which means either you, someone in your household, or a hired person does the cleaning. Etc. So you are paying for war (if you believe taxes fund Federal spending, which isn’t true, but the political class belief that thats true does turn that into a practical constraint) by paying for services and the labor content of goods you buy. There’s no way around it. I volunteer to do essentially convict labor, because I don’t enjoy seeing litter on the road, that sort of thing. Or in the case of working for yourself-yesterday would be a good example of putting in 5 hours on the job sans pay. We had 4 inches of rain-the first decent amount since April, combined with 40-50 mph winds a few days later, and a few foot wide trunks of multi-trunked Live Oaks about 60 feet tall gave up the ghost and came down, along with other limbs that broke off on other trees. As far as our vaunted MIC goes, i’m under no illusion that my tax payment means anything, just as financing the ongoing boondoggle makes no sense whatsoever in the overall scheme of things. If it was a business, the MIC would’ve gone Chapter 7 eons ago. Oh, come on. Are you telling me that cleaning your toilet and bathtub is because you want to? Narrowly that is correct but you imply it’s voluntary, when it is voluntary only to the extent that the alternative is to have really nasty stuff start growing. People spend something like 19 hours a week on household chores, and most people consider that to be drudgery, witness that men typically fob that off on their wives. Now some people do find cleaning a distraction from other work they find stressful, but they are in a minority. They call them household chores for a good reason, and it’s something that needs to be done, or your place looks like a pigsty. That sort of work is hardly voluntary, but necessary. Not that far removed from trash pickup on the road, the difference being that i’m not only doing it for me, but also the community. I call BS and argue the opposite. Beggaring the heirs and putting them to work for the economic contribution generated by them sullying their hands wouldn’t amount to a hill of beans. There aren’t enough rich people to notice in the grand scheme of things. Added to which, don’t the rich in general, have a whole flotilla of hanger-ons obsessively fleecing/pumping/extracting money from them? They’d be put out of work at the same time, right? That alone is a negative contribution to the economy, right? Plus a lot of the ‘wealth’ we’re talking about is handed off as a business owner to a daughter, or a landowner like a farmer, passing off his farm assets to his children. The point being most are working enterprises and facing punitive taxation, said farm, hardware store, car dealership, bank, or what not is just sold off to a more wealthy entity. Tell me again how this is a happy thing. Me? I find the tenor and tone of the article mean spirited. You may be correct that the tax revenue generated by the labor of those involuntarily cured of their affluenza would be minimal. It still doesn’t follow that the rich should be allowed to escape inheritance taxes. Inequality is killing our entire society and the overwhelming majority of those who believe they’ll be super rich someday too are spectacularly wrong. Also, the idea that inheritance taxes would take away the family farm has been debunked over and over and over again. The heirs will be fine. Nobody loses their business from.the estate tax. You might have to spin off the Dodgers if youre rich enough but that didnt beggar amybody. You’re allowed to give $15k/yr to anyone. That anyone includes each of your children. That’s a significant fraction of the median annual personal income in the United States. Start now, and that family business will stay a family business for a very long time. The annual exclusion applies to gifts to each donee. In other words, if you give each of your children $11,000 in 2002-2005, $12,000 in 2006-2008, $13,000 in 2009-2012 and $14,000 on or after January 1, 2013, the annual exclusion applies to each gift. The annual exclusion for 2014, 2015, 2016 and 2017 is $14,000. For 2018 and 2019, the annual exclusion is $15,000. You are each entitled to the annual exclusion amount on the gift. Together, you can give $22,000 to each donee (2002-2005) or $24,000 (2006-2008), $26,000 (2009-2012) and $28,000 on or after January 1, 2013 (including 2014, 2015, 2016 and 2017). In 2018 and 2019, the total for you and your spouse is $30,000. Help me. Go look at the difference between median wealth and average wealth. That alone is proof of how significant the wealth held by the top cohort is. The point is that there isn’t a loss in taxing inheritances. The state gets revenues from that and the heirs also wind up working more than they would otherwise. The point of taxing the rich has more to do with preventing them from having enough money to purchase our government, not the notion that their wealth is ‘immoral’. The inevitable result of the present level of wealth inequality is, and has always been the ability to freeze ‘We the People’ out of being able to influence our government. Our current situation is that we have no influence with Washington because they’re in the pocket of their donors. Does the phrase “taxation without representation” ring a bell? That’s kinda the reason whole reason for and endgame of a very large part of the Earth’s 0.001% and of those who aspire to be their local community’s wealthiest. Too many equate wealth with superiority and superiority with the right to have power over others. It’s whacked and not everyone of any class believes that. Not even all the wealthiest 0.001% but too many do and their money gives them vast resources and very real power. Taxes are a problem. Nobody likes to have money taken away from them – earned or not. I believe a very small transaction tax on every transfer from one account to another is the best way to go about it. The poor do few transactions/transfers and will pay a negligible amount. The rich that do nothing with their money will also pay very little. But money under the mattress is of little use, its main use arises when its put into circulation and that will excite a tax. Those that are economically most ‘active’ will pay the most in taxes. A transaction tax will also reduce churn, high frequency trading, and plenty of accounting shenanigans. Also, why cannot states/provinces and local governments issue currency? Perhaps coordinated by a central authority? Should endogenous money creation not be shifted from banks to governments of all levels? No State shall . . . make any Thing but gold and silver Coin a Tender in Payment of Debts . . .